While Europe gets all the credit for the rise of efficient offshore wind farms, there’s a lot of potential brewing in Asia — especially in countries that already have active land-based wind power. China has already built so many inland wind farms on land that it has more capacity than its interior population can use — which frequently idles many turbines. Coastal cities, however, are much more hungry for power, so offshore wind is still a priority. South Korea’s first offshore wind farm is set to be commissioned later this year, with 10 turbines near Jeju, an island south of the nation’s mainland. 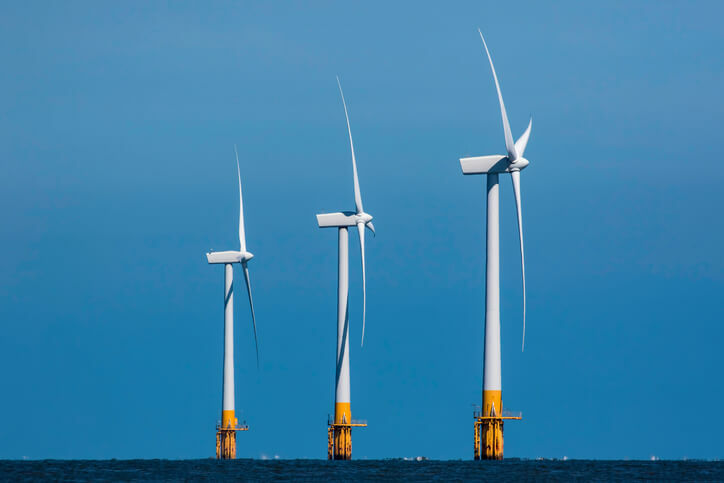 Japan has a smattering of small offshore wind farms and plans for innovative floating platforms, and Taiwan is getting into the offshore-wind game as well. India’s 4,600 miles (7,500 km) of coastline present abundant opportunities for offshore wind development. The world’s most populous democracy already has a goal of producing 60 gigawatts of wind power by 2022, but offshore wind farms are still years in the future. Sarvesh Kumar, chairman of the Indian Wind Turbine Manufacturing Association, said in an interview with LiveMint.com that he expects India to be ready to implement offshore projects by about 2020. Experts are already scoping out the potential of the coastlines of Gujarat on the west coast and Tamil Nadu in the southeast. The city-state at the southern tip of the Malay Peninsula is well-known for its innovations in finance, industry, and technology. All those assets are coming into play as Singapore ramps up its focus on renewable energy sources. In one of its most fascinating renewables initiatives, Nanyang Technological University is building an energy plant that combines elements of solar, tidal, wind, and power-to-gas technologies in a demonstration project that could potentially bring cheap electricity to remote islands with small populations. The project will develop four microgrids that can provide about 1 megawatt of power, enough for a small community living in an area with abundant sea resources. It also could be an emergency energy source. Though Singapore’s topography makes it unsuitable for domestic wind power generation, many global companies in the wind-power sector have set up Singapore offices to take advantage of its access to capital and technologies. So don’t be surprised to see the city-state come up in renewable-energy discussions. Microgrid developers no doubt had Indonesia on their minds, given that the archipelago has more than 900 inhabited islands. The nation’s far-flung population complicates its renewable-energy potential, but it’s still aiming to ramp up its commitment to green energies, including wind power. Indonesia’s opening forays into wind power are ramping up on land, with the Danish company Vestas supplying turbines to a 60-megawatt wind farm in the province of South Sulawesi. All those islands have potential for developing offshore wind as well — a fact not lost on the European firms working to get a toehold in Indonesia. Meanwhile, a tidal energy project in Indonesia uses a novel approach: attaching underwater turbines to a floating bridge. The Palmerah Tidal Bridge will install tidal turbines close to the water surface where there is more water movement — and hence more energy potential — than turbines installed on the sea floor. The rising economies and growing populations of Asia will place ever-increasing pressure on the region’s energy systems. Indeed, forward-looking Asian nations have developed ambitious renewable-energy goals that will require substantial expertise and capital investment. The maturity of wind power in the U.S. and Europe combined with the massive growth in China mean there’s plenty of renewable energy expertise across the region. It’ll be incumbent on entrepreneurs, financiers, and governments to find common ground to take advantage of these opportunities.